31-year old Uchenna Precious Onwuamadike the wife of notorious kidnapper Chukwudi Dumeme Onuamadike, alias Evans has denied knowledge of her husband’s alleged criminal activities. 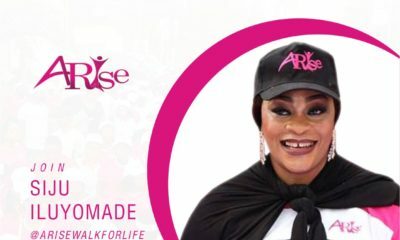 Speaking to Vanguard, she talked about her marriage and life with Evans and pleaded for mercy on his behalf, calling on Nigerians to forgive the Kidnapper for the sake of their children. My name is Uchenna Precious Onwuamadike, the wife of the Chukwudubem Onwuamadike who you call Evans. I am 31 years old. I got married to Evans at the age of 17 at Oraifite, Anambra state in 2004. He met me while I was coming back from lesson as a student of All Saints Secondary School, Oraifite and I was in class 6 going to take my West African Examination. After we met, I agreed to go with him because of my poor background. Our marriage is blessed with five children. Our first issue is 12 years plus. After we got married, he said I should stay with his mother in his village at Akanmiri, Umudim, Nnewi to teach me how to be a good housewife. I was there for three years before he took me to Lagos. We were living at Satellite town in 2006 and after one year, he relocated us back to the village because he could not pay house rent. While in the village, he normally came to see us. We spent three years in the village and relocated to Ghana. On our way to Ghana, we passed through Lagos and stayed at Benny Hotels in Festac where we spent two days before travelling to Ghana. He spent a month with us in Ghana before coming back to Lagos. I was pregnant with our fourth child in 2010 when he left for Nigeria to come back in two months time. After I gave birth, he came back four months later and was able to clear the accumulated bills we kept for him because I borrowed money from friends to clear hospital bill. When he came back, he complained bitterly that things were rough for him in Nigeria and that customs seized his goods. I was not aware that he was into kidnapping and all the criminal acts he is being associated with now. All I know about his business is that he was into haulage, buying engine and spare parts for trucks and imports exhaust pipes. That was what he told me. The reason he kept me in Ghana was because he said our children should get quality education. I have spent six years here and after I stopped hearing from him, I called and complained bitterly but he said I should stay for some time. I then called his friend, Okechukwu, who now lives in China. He told me that he has not been seeing him and that he spends most of his time with a girlfriend in Festac. When I called him to complain, he was angry with me and warned that I should stop listening to gossip. He said that If I should return, I should go to his younger brother’s house in Lagos until he is ready to get accommodation for us. The brother was formerly living in Lagos but he is in Brazil now. So, when it was impossible to pay my children’s school fees, I packed my bags and came back to Lagos with our children. We stayed at his brother’s house at Agric, close to Trade Fair until he took us to a house in Magodo where he claimed he owed rent pending the completion of his own house there. We have spent just one year in that house in Magodo. I have no idea of the type of business he was into but he told me that his friends overseas used to buy phones and jewelries for him. While in Lagos, I was idle and I pressured him to find something for me to do and he promised to do that. Several times, I asked him to take me to his office but he said they move from place to place to offload goods in haulage business and share profits. I can’t remember having any visitor in our house. It is only the agent called Sunny that helped us to pack into our house that I know. At times, artisans come to do one repair or the other, that’s all. I don’t know any of his friends and if we were invited to parties, he would not allow us to attend. He told me that he has no friends and that he hates associating with people. I was always indoors because he warned me to beware of Lagos women that they are wayward. I was staying indoors and it was only when I was sick that he took me to a hospital in Ikeja. I always have BP and it makes weak. We went back to Ghana on the 6th of this month and he promised to join us in no distant time. On the 9th, I called him to know when he would be coming and even the youngest of our children was crying, begging him to come as soon as possible and he promised to come. In the afternoon, I called but he was not picking. I called again, there was noise in the background and the line was switched off. I then called the driver that took us to the motor pack when we were going to Ghana and he told me that there was a problem, that police came and arrested Oga and that they came with a fair complexioned lady. When I heard all the allegations against him, I called his brother in Ghana, his mother, father and other relations but I could not get them. I then called their last born, a student at Oko Polytechnic but he said he had not spoken with him for long. I was confused until I opened Nigerian news websites. That was how I got the shocking news about my husband. I have not been receiving money from him, I have never seen his money. The only thing I know is that there was a time he bought an expensive watch in Dubai and I wanted to know why he bought it when he could not open any business for me. He kept on teasing me, claiming it came from a friend. It was only when we wanted to travel to South Africa last year Christmas where we spent two years that he gave me N200,000 for the trip. I have never seen him as a rich man. While with him, we made sure we had all we wanted to eat and that’s all. I can’t remember seeing any sign of affluence in him. He is not a proud man and he has been wearing one sandal and slippers for long now. He does not go for parties. In fact, I have never suspected him as a criminal. If I have been seeing any strange things, I would have suspected him. We have three cars, one Hilux, one grand Cherokee and an SUV. The N20m they said he sent to me through transfer was given to one Hausa man to pay into an account in Ghana to be used in paying our rent and furnish the house in Ghana. I am not aware that he has five girlfriends and I have never suspected him because he did not keep late nights. It was shocking to hear about his girlfriends. He did not answer calls in my presence. I used to see his phones being charged but he normally switched them off. I always asked him why use pin code to lock his phones and that he lived a secret life but he threatened to beat me if ever I touched any of his phones. I didn’t even know the security pin. He would leave the house sometimes in the evenings with his phones and would come back between 8pm and 9pm. Most of the things I read about him are strange to me. As his wife, I should have seen the signs but I have not. He has cancer and does not drink alcohol nor smoke anything. I am suspecting that whatever happened to him must have come from his father’s second wife. I don’t know what he did to him when he was young but he told the story. He said that after their mother was driven out of the house, he was with his brothers playing outside one day when the second wife called him to pick a bucket and collect water for her. He was four years then, he picked the bucket, collected water and when he came back, she removed her dress and she was wearing only a bag made from animal skin on her waist. She brought seven small stones from the bag, gave to Evans and ordered him to pour the stones into the bucket to know if the gravel would rise (sail) on top of the water or not. Evans said he did as she directed but the only thing the woman did was to take the bucket back and ordered him to go back and play with his brothers. He said he told his father later but he said he was telling lies. I feel very bad because I did not know if he was doing all these or not. Even if he was into all these, why did he not stop because of me and his children? All the time when we pray, he used to promise God that he would tell Him his story later in life. Here reads psalm 23 a lot. Even his phone, he sets alarm for 12 noon to read psalm 23. He took part in our daily prayers in the morning, evening and night. He used to lead us in prayers. I am appealing to the powers that be to spare his life (crying), as I speak now, I am kneeling down with my children, crying and begging for forgiveness. Have mercy on us. He did not know what he was doing. He did not know what came over him. I am ready to come back to Nigeria and plead on his behalf. What I am reading in the news is shocking. Though, I have not heard that he killed anybody but all those he injured or took their money should please forgive him because me and my children. They should kindly forgive him, he will repent. God knows I will not be alive and see my husband doing bad thing and keep quiet. All his wealth should be sold off and given to his victims. Evans is a good man. I am ready to come back and testify on his behalf. I will also like to see the Governor of Lagos state and explain the whole thing to him. They said he is rich but I have only N13, 000 in my bank account. He does not give me money. He told me he will be paying N40, 000 into my account every month but after two months, he stopped, claiming that he was penniless. Forgiveness? What a stupid woman! How about all the lives he wasted? This one na story for their ancestors! Madam just keep quiet and stop exposing urself the more. Y’all have taking part in crime. Thats the bottom line. You’ve tasted and benefitted from people’s hard earned money. Travelling upandan. Your husband made several families wretched after stealing, killing and traumatising them. The only person I seem to believe is his father. Wow. The outrage from the Nigerian community is outstanding. It is great to know that people have not normalized murder, kidnapping and thievery. At least the overt kind. She definitely must av known DAT d husband is a criminal.how come sheez denying it now?so annoying jor!ur husband sent u 20million naira in dis buhari tyms nd u still dnt know d kind of job he has to av produced DAT kinda money.plenty innocent pple av died cuz of his evil heart nd work he does to feed u nd ur kids now ure begging.all deez ones na story if na Malaysia or Korea or doze Asian countries dem for don hang am since.wat of d families DAT cried cuz of deir loved ones he killed.abeggee no mercy kankan.ekpa man yen danuu.ekpa Evans yen kiakia!I Neva knew ma husband was a criminal onironlaa!buh u went to south Africa baa?datz d first tin u shld know as a woman.wat ur man does for a living not wat he told u he does for a living.women be observant even wen dey lie try ur very best to know wat ur husband does for a living.God go save us oh!!!! Which Kin woman be observant, this woman is a criminal herself. Most women are just as bad if not worse than men. She enjoyed the kidnapping money, moved around, went on vacation yet claims to be poor. She’s very greedy, and evil. I wish she cam rot in jail too. . Very pretentious woman. She probably pushed him more bcos she asked for more money. And she has the guts to say she’s begging for forgiveness. God punish you and your husband. She’s just a pathetic liar. after globe trotting you claim you did not know what your husband does for a living. #Wehdone ma! She doesn’t even know how to lie,she contradicts herself in this story,you are forming managing,,you travel but he cant pay your rent in ghana ,pls how can they have gone to S.A. last year and stay there for two years?,even my two year old would tell a better story! I’m angry ehn!see as d children fresh!u would know from deir skin DAT deir dad takes good kiaff dem.wat is dis woman saying.gbege don happen ee call 2nd wife wey dey village jejely.even if sheez responsible sef,y dint he pray himself out wen he noticed d traits of wickedness in him?y dint he try to stop doing doze tinz.u know he has been I to it for long.otii moor laaraa!if dey had not caught him now,will she be begging upandan?sheez wants to see ambode ova nonsense mata.for him to av sent u 20million it means d house in Ghnana na die!haba!dis woman jst keep quiet nd pray for his soul.all d tinz he did nd him clear eyes nd he can attest to it.train it kids well so dey dnt behave like him.datz d least u can do for dem.forget DAT man mata!heez gone babez! Abeg madam just gerroff. Do you know how many people’s lives your greedy so called husband has traumatised. Gerroff not. Besides your stories don’t tie up. Funny madam! He wasn’t rich but you went to south Africa on holiday, you moved into a mansion in magodo, you relocated to Ghana, he sent 20million to you and you NEVER saw evidence of any job or business?! Clap for yourself!!! SMH. delusional woman.Pretenders. You are not rich and yet you a house wife, has 13M in your account. Your family has three cars. He gave you N20M to give to a man for house rent and other bills and yet you say you are not aware of his wealth. You stayed for a while in his mansion in magodo and yet?….. Madam, you just incrimated yourself with this interview. You and your husband deserve to suffer as you made others suffer. I bet you have millions of naira and dollars hiding somewhere for you to voluntarily tell the world of your 13m just to divert attention from the remaining money. You think people are stupid and? 13m my foot. Fake a** people. After reading or hearing of his crimes, do you seriously want Nigerians to forgive him? If you do, then you are clearly no different from him. He has fingered you as a conduit for the ransoms he obtained from his victims. Your husband deserves to pay for his crimes and so does everyone connected with him. Too bad you both brought this on your kids, the life of comfort would be strip of them and who knows how they’d be catered for. While dreading the consequences of you and your husband’s actions, realise that no one is to blame for your husband’s actions- not his father, step mother or his mum. He is an adult and is responsible for his actions. She said he is always home but again said he is always away. Why does she want to protect him. He even said if she touch the phone he will beat her. Why. This woman is a liar ,Evans said and I quote’my wife didn’t know I made my billions from kidnapping’ she knew her hubby was stinkingly rich,see the kids now..she’s just trying to cover up.he owns 3 expensive cars yet you didn’t know he’s rich.owns a duplex in magodo that u lived in for a year.you are aware that he owns 3other house in Ghana,transferred #20m to your account. Madam you are a liar. 5 kids at 31 and no job. Some woman a stupid. Keep legs crossed for a minute and look for a job. Hilux, grand Cherokee, SUV re dos cars jalopy? Even Sumone dat is working on a monthly income cannot afford those kind of cars. Everything u have said here does not match at all. Even ur husband said in his statement dat u do pickup ransome for him so why re u doing dis(lie). #freeaudu is trending on twitter because of this woman’s croc tears. That is a manifestation of the stupid Nigerian mentality that if it did not happen to you or your family, it is not your cup of tea. How disgustingly backward and heartless. He has to pay for what he did. Why do people feel the need to let people free just because they are “sorry”. Same thing with that idiot that said in the comment section that we should leave Bisola Abayomi Ojo to be free just “because she apologized and said she was going through depression”. *SPITS IN THUNDER*. To hell with your pity. Evans robbed families around the country of peace of mind and happiness. And of course, their hard earned money too. This guy is a freaking billionaire from kidnapping. Did you get that??? He should rot in jail. If the Nigerian judiciary allows this man or Bisola Ojo to go scott free I will run for president. Madafockers. sorry i mean #freeevans haha. You can tell I was a #freeaudu shouter lol. Crocodile tears, this woman knew about her husband illicit job! Those kids looks like kids that are well taken care of. Most Nigerians are gullible, how can they even make up a hashtag for her evil husband to be freed. This was was living a lavish lifestyle with her kids yet, she claims not to know about her husband’s dubious dealings. She should be jailed with her crooked husband. Haaa! Ogaa o! I would believe her because I know some women who are totally unaware of the exact business their husbands/boyfriends/fiancé do, they just know “my husband is an importer, my boyfriend is a contractor”. In such households today there’s plenty money, tomorrow they are buying a loaf of bread on credit. I feel for the woman and her kids but madam just count yourself a widow, nobody is releasing Evans. Let us hope that the Aboki into whose account your husband transferred N20m will release the money to you so you can start a business and fend for yourself and kids. @cocolette, release which money to her? Every money they recover should go back to the real owners. Evans mentioned names of the people he collected those money from, they should sell his properties and close his bank accounts and take every dime they find around him back to his kidnap victims. The money from the ‘Aboki’ as you put it, may have been part of a ransom he was made to pay. I spent the better part of my morning reading the ordeal of his victims. The experience is just too much for words, living in fear for months at the mercy of complete strangers. His last victim who escaped is now bankrupt and trying to pay back bank loans. That’s just one of the many lives and homes he wrecked; those are the people refunds should be made to no matter how small. As for madam, she was living in the clouds, a life of temporary and superficial wealth. It was all a mirage and she’d be very lucky if she doesn’t get locked up too. ‘To my mind’ that women and are husband planned this emergency story, only that they did not plan it well…you are not working, he did not send money to you for 4 months but you and the children survived abi…he came to Ghana after four months of giving birth to clear the accumulated debth, shey hospitals in Ghana are free ni? Even if they are free, what of the expenses of pampers? Maybe stores sell on credit sha…what I know is that the sentences in that story are just slapping each other. She may not known he was a kidnapper but she sure knew he was up to no good. May God grant us wisdom to know when to stay silent and not make a fool of ourselves. Anyways this story doesn’t sound fabricated. It is detailed but not fabricated. I believe she’s telling the truth but she might have suspected something but maybe just not bold enough to ask or investigate. You know women have a way of living in their own bubble. And to think that this woman brought her children to fake-cry with her for pictures is very annoying and hideous. Bellanija tried to blank the Children’s faces unlike other blogs. This woman should be arrested as his psychological and emotional accompliance .Imagine how many Nigerians that have ever owned 30 million in their lifetime even till death?…Shameless woman .I pray that the government demolishes all his building and sentence him to death by hanging so that others would be taught better.Apology my foot! Stupid woman. Imagine what she put into this staged drama.. loosed hair, crocodile tears, no makeup, modest clothes. Did you and your husband consider the fact that his victims had kids too? Evil couple, leave your kids out of your shenanigans! As in. She has evil written in her too. 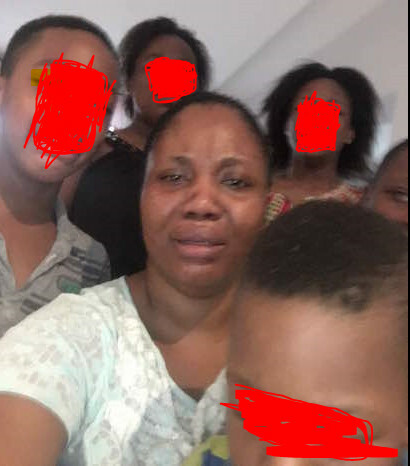 Imagine using her kids to blackmail Nigerians emotional. Ogbonge criminal. She should be found and asked to face justice too. Maybe that way she will know the gravity of their acts. Unrepentant women! He is a good man…….u need help check what you are saying….a kidnapper is a good man…how? Rubbish! Now all the criminals they catch will ask their famity members to start recording plea videos with crocodile tears. If the families of the people he kidnapped had recorded and sent plea videos to her husband instead of 1million$ would he have listened? Evil woman!!!! Hear yourself!!! Liar!!! Go and read the heartbreaking story of Chief Donatus Dunu (Maydon Pharmaceuticals) that your husband, Evans kidnapped and rendered bankrupt! The man escaped after 90 days and now lives in hiding out of fear! Evans should be EXECUTED publicly and let his children see and learn!! Yes, I said so because many years ago one man was executed for armed robbery but his son who was just a toddler then grew up and became an arned robber. Guess what, the boy was shot dead when his gang went on a robbery operation in 2012. This evil seems to be in the ‘bloodline’ of some. Evans’ wife should be arrested and tried as an accessory to the crime of kidnapping. $1m ransom! Four different victims!!! Evans, you are more evil than the devil!!! Other people’s sweat! Countless victims you extorted 85m to 150m while others paid 20m! Your stupid wife had the guts to tell this silly story and dared to ask for forgiveness! This woman’s children go to the very best school in Magodo, all FIVE of them, was it borrowed money they used to pay their school fees. Bloody liars. See eh, Nigerians must hold the govt accountable for this man. He must pay for his crimes, this shouldn’t get swept under the rug. Excuse me ma KOLEWERK I hope you understand? Your Husband that will soon be executed at Barbeach ?? I wish they still kill Criminals like your Husband and his gang like that.. So that I’ll go and watch and Sing “Oju ole re Ole” But seriously, all this your make up story is for your ears ma..
Well, I don’t believe this woman. But what is annoying me is that she had to snap this innocent children’s face and circulate them on the Internet to earn pity. These kids might grow up to change their names, and naturalise elsewhere to get rid of this bad memory and scar. But with this picture, people can always dig them out, and hunt them with it however far they go in life. So this is totally a bad idea, ma’am. 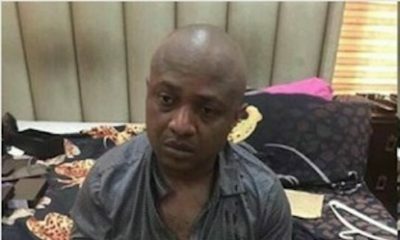 Evans should get the DEATH PENALTY which should serve as a precedent to others who think it’s okay to kidnap children, mothers, fathers, siblings and relatives. Whether they are killed in the process or not is irrelevant, the trauma families go through out of the fear of not knowing what to expect is indescribable. Who is genuinely in tears and all you can think of is taking a picture of yourself crying? Ugh! She’s a f*&%ing lunatic. Why the f&^% should they forgive him? For whoever’s sake? This woman’s mind is ALSO twisted. Clearly she doesn’t see anything wrong in all he has done for her to publicly make such remark. Wtf?! Lol @ “he has cancer”. Who told you? Ughhhhh! Why will you ask for mercy and forgiveness. That’s soooo insensitive. Why will anyone say he hasn’t killed anyone. A policeman died, so many more may have died physically, financially, emotionally, psychologically. People’s health deteriorated from worrying about their loved ones. Evans is a good man? This woman should be arrested too. He is not a rich man but “We have three cars, one Hilux, one grand Cherokee and an SUV. The N20m he sent me…”. Is that how the average Nigerian or Ghanaian lives? Am I the only one fuming? Her story is believable. Look at her profile, probably uneducated, married at 14yrs or so, totally sheltered and under the control of her husband. She’s obviously not empowered, can hardly put the clues together and definitely has no strength to pursue any suspicions..